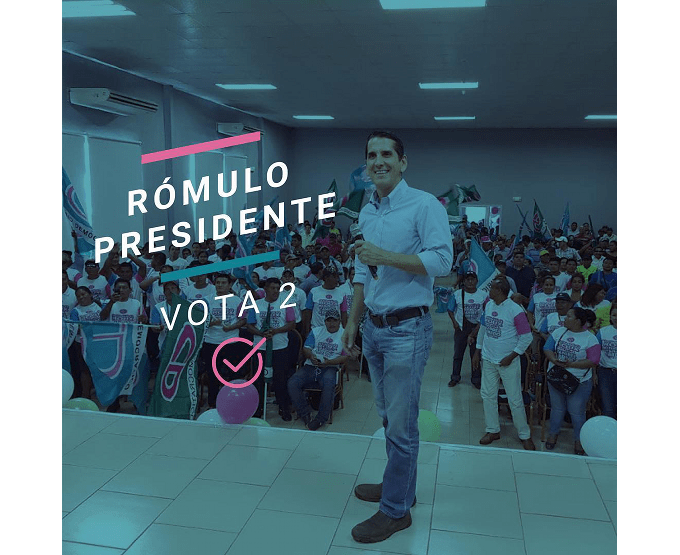 A Rómulo Roux campaign graphic, from his Facebook page. Ricardo Martinell probably won’t die behind bars, and if ever after all of the criminal cases are finished the man gets his political rights restored, he may be able to buy himself into this or that public post. But first people would have to forget. He might have more success as a behind the scenes power broker with a lot of money, even from behind bars. But he has been trying that one ever since he fled Panama early in 2015 and whether it’s because he’s stingy, because he has to avoid tipping off authorities to the location of assets that they might seize or because he’s just tainted goods on the always tawdry market for his sort of politics, the Martinelli era is over. By a resounding 1,486 to 860 vote he has been stripped of the party presidency that he had always held. It wasn’t just tactical voting. Yes, Ricardo Martinelli had and has a thug in place as Electoral Prosecutor Eduardo Peñaloza, so there were no significant criminal prosecutions for 2014 vote-buying campaigns waged with hundreds of millions of dollars in funds stolen from the public treasury. In the end his appointees on the high court and their appointees lower down the judiciary might also keep him and most of his minions from doing much time, but Ricardo Martinelli’s standing as a potential Panamanian leader in early 2018 is roughly analogous to that of Manuel Antonio Noriega in early 1993. Martinelli is finished not only because he lost his bid for another term by proxy in 2014, not only because he is the most notorious of criminals, but because he tried to bully those who has supported him. Within two weeks of losing the 2014 election he gathered the Cambio Democratico legislators-elect — some of whose elections would be overturned when they lost re-runs brought on by civil findings of vote buying with state funds even if Peñaloza wouldn’t bring the criminal charges. He told the deputies that they had to do what he told them to do because he had complied a dossier on each of them. But it wasn’t long before most of the CD caucus in the National Assembly was thumbing their noses at him. It all came down to a delayed and low-participation process of electing new party leaders, starting with convention delegates. On January 21 the party delegates spoke on the issue of the presidency, choosing corporate lawyer, former canal affairs minister and former minister of the presidency Rómulo Roux to head the party. It was not close. Although there will be a primary for the 2019 presidential nomination, Roux want that and all of the other people mentioned for the post are in and out of jail fighting multiple corruption charges. The primary race is Rómulo Roux’s to lose. We don’t actually know Roux’s standing with the public. A photogenic attorney who went from Morgan & Morgan into public life and has managed not to be accused of any crimes may at a glance look like the head of a winning slate. President Varela’s cabinet may express mortal fear of Martinelista subversion infiltrating a large crowd that would like to see both Martinell and Varela behind bars, but that’s a desperate spin. The other major party, the Democratic Revolutionary Party, is also in disrepute and disarray so perhaps nobody should be counted out. Strains of the PRD would pull it in the direction of an alt-right anti-immigrant party, a social democratic anti-globalization party, a political patronage party with a leader not so creepy as Ricardo Martinelli or just another oligarchic bankers and big business formation. Perhaps the PRD might hybridize two or more of these strains. The scene looks set for an independent to come from out of the blue, but the election rules make that difficult. In any case, count Martinelli out.